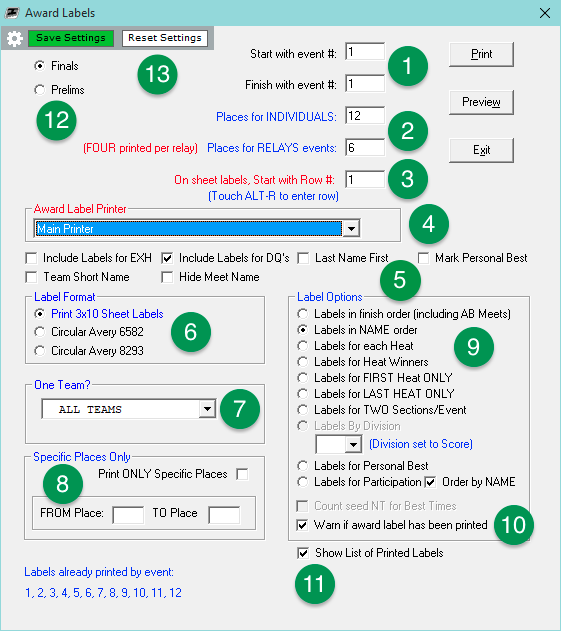 Labels may be printed as you finish entering times for the final heat of any event. Award labels show the meet name, date, athlete's name, team, event, time and place. Award labels may be easily stuck onto ribbons or medals giving the athletes a record of their performances. You can access this one of two ways. Start/Finish with event # — Enter in the start and end event #s for this report. Places for Individual/Relays — Enter in how many places to generate for this report. On sheet labels, Start with Row # — This will allow you to start at a specific row number if you have already used a portion of the labels. Award Label Printer — User the dropdown to select your printer. Info to include — Select any options to include on your labels, such as EXH, print Last Name First, etc. Label Format — TouchPad offers three label options: 3x10 Sheet Labels (Avery 5160), Circular Avery 6582, and Circular Avery 8293. One Team — Use the dropdown to only export one team or leave the default ALL TEAMS. Specific Places Only — You must check the box to denote you only want specific places and then designate which ones they will be. Label Options — Select how you want your labels to generate based on athlete, heat, etc. 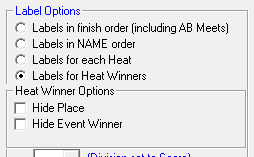 Labels for Heat Winners — You can optionally hide the place of all swimmers (and show WINNER for each instead) and/or the event winner (since they will have already received an award label when printing awards for the entire event). Labels for Personal Best — You have several options. Show Improvement shows how much they've improved from their seed time. Order by NAME groups all awards for each athlete together. Labels for Participation — They are sorted by first name (unless you check Last Name First above) when Order by NAME is checked. Uncheck it to sort by event and then placement in the event instead. Warn if award label has been printed — This will let you know if the label has already been printed. Simply answer the pop up prompt to continue. Show List of Printed Labels — This will help you avoid printing duplicate labels by listing ones you've already printed. Finals/Prelims — This selection only appears in prelims/finals meets. Select which one to print award labels for. Save/Reset Settings — Make all the selections how you like for defaults, then click Save Settings. It will give a confirmation screen to check your selected settings; click Save or Cancel. The next time you open Award Labels you will see everything* set how you saved it. If you ever want to revert to the "factory" settings, click Reset Settings. * The only setting it won't save is Labels by Division. Be sure to test the printing of labels on paper well ahead of your meet to be sure that all works properly on your system.